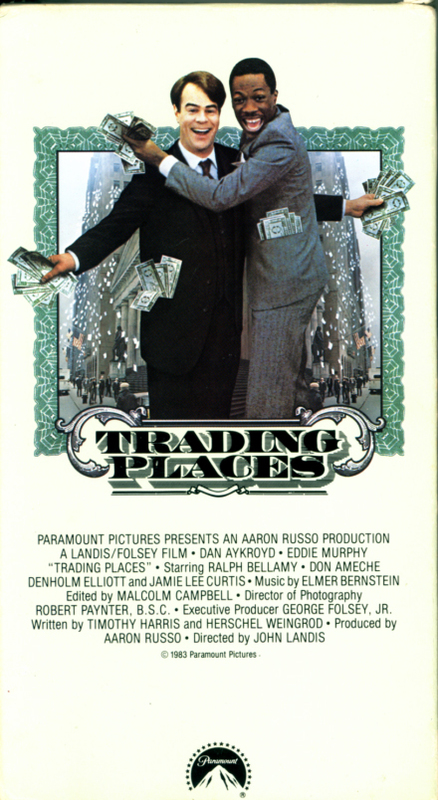 Trading Places on VHS video. Starring Eddie Murphy, Dan Aykroyd. With Denholm Elliott, Ralph Bellamy, Don Ameche, Jamie Lee Curtis. Directed by John Landis. 1983. Eddie Murphy established himself as a comedy star of the highest magnitude as Billy Ray Valentine, a streetwise hustler. His fellow “Saturday Night Live” alumnus, Dan Akroyd also stars as Louis Winthorpe III, a wealthy investment executive at Duke Brothers, a Wall Street firm. The fun starts when thee rich and greedy Duke Brothers wager a bet on whether a born loser (like Valentine) could become successful as Winthorpe if placed in the proper environment; and if a prig like Winthorpe were to lose all, would he turn to a life of crime? The Dukes arrange for that to happen. Valentine becomes the golden boy of the commodities market and Winthorpe finds himself out on the streets. Beverly Hills Cop on VHS. Starring Eddie Murphy. With Judge Reinhold, John Ashton, Lisa Eilbacher. Directed by Martin Brest. 1984. 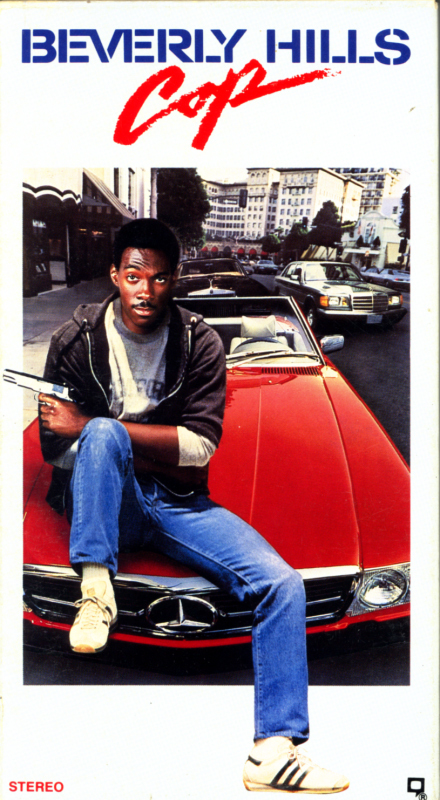 Eddie Murphy’s hilarious portrayal of Detective Axel Foley has propelled Beverly Hills Cop into the ranks of the top ten biggest box office hits in history! Foley’s a brash, street smart Detroit detective who follows the trail of a friend’s murderer to the posh surroundings of Beverly Hills. And before Axel gets his man, he gets up to his neck in an international network of smugglers and drug peddlers. It’s a fast paced adventure that proves the difference between a really good comedy and a great comedy is Eddie Murphy. 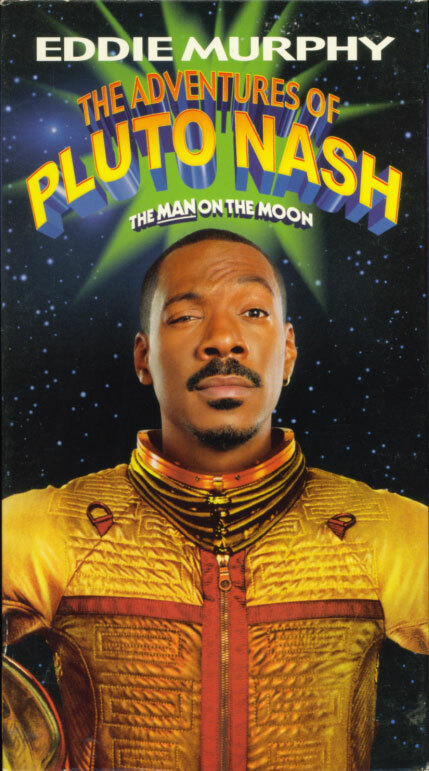 The Adventures of Pluto Nash on VHS. Starring Eddie Murphy. With Randy Quaid, Rosario Dawson, Joe Pantoliano, Jay Mohr, Luis Guzmán, Peter Boyle, Pam Grier, John Cleese, Alec Baldwin. Directed by Ron Underwood. 2002. The year is 2087 and the future isn’t what it used to be now that mobsters (including Joe Pantoliano) are putting the squeeze on Club Pluto, the nightclub Nash runs. But audacious Pluto isn’t ready to kiss his assets goodbye. With the help of his robo-bodyguard (Randy Quaid), an aspiring singer (Rosario Dawson), his heat-packin’ ma (Pam Grier), a schnook-turned-superstar entertainer (Jay Mohr) and more, Pluto’s going to blast the mob into orbit.